In a unique position, in the highest point of the village of Montepulciano, which borders the Medici fortress dating back to 1261 and a step away from Piazza Grande is THE GARDEN OF FORTRESS, an apartment in Tuscan style with a stunning panoramic view across the valley di Chiana, from Trasimeno lake Cortona until the Marche Apennines. Housed on the ground floor of a villa built on the foundations of an old local house, the apartment has a lounge that opens onto a lovely private garden next to the public gardens of the Fortress, a fully equipped fitted kitchen, two elegant and comfortable double rooms each with its own bathroom. The two bedrooms are decorated in unique style furnishings. A beamed ceilings wooden beams, overlooking the Val di Chiana and a private bathroom with shower. The other is an internal view of local gardens and an en suite with shower. The lounge that opens onto the private garden is equipped with a comfortable sofa bed, a flat screen TV and a large dining table. The garden is quite unique within the medieval walls, is provided with a comfortable dining area where you can enjoy a glass of local wine. There is also a garage facility, unavailable and singular, with convenient access via electric gate. The apartment has a flat screen TV with satellite, wi-fi dishwasher, fridge, hairdryer, kettle, toaster, electric oven and microwave. Shops, restaurants, historic wineries, the beautiful Piazza Grande, everything is at hand. Perfect place for two couples or a family. Davide and Raffaella’s apartment in charming Montepulciano was perfect. It was spotless and Davide greeted us upon arrival. The only hitch in getting there was a street that was blocked for construction. Even though we were in the historic part of town (very historic), the apartment was very modern and well- designed. We would love to return to this beautiful area and would definitely stay here again. Our family of four completely enjoyed staying in Rafaella and Davide's guest quarters! They have done a beautiful job renovating the bathrooms and decorating this perfectly situated mountaintop retreat. It has all the charm one could hope for as well as modern amenities. The beds were very comfortable, the showers hot, toiletries were available as well as bottled water and espresso. We were greeted at the gate, gifted a lovely bottle of local wine and they generously made reservations for us at a local restaurant. Our only disappointment was that our stay was so short. 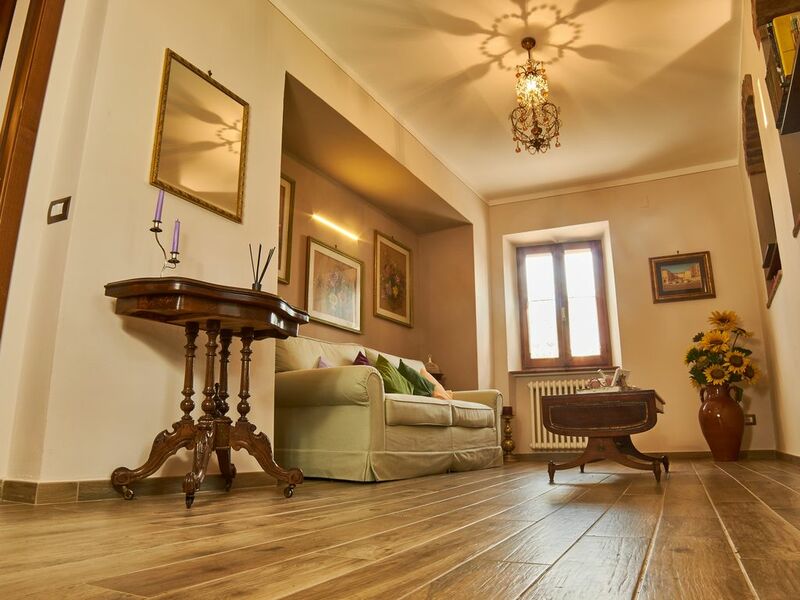 We had a wonderful stay in Montepulciano, the apartment was just as nice as the website promised it would be with beautiful indoor and outdoor spaces. Raffaella and Davide were the perfect hosts and gave us great local tips and advice. We would certainly recommend this apartment to anyone visiting Tuscany. superb location, modern convenience, and old world charm. Our stay in Montepulciano was the highlight of our trip to Tuscany. This apartment is in the BEST location, adjacent to a beautiful public garden, with birds chirping and the corso (main street) AND Piazza Grande only a block or two away. And the parking space was a Godsend. Davide and Rafaella went above-and-beyond the call: when we needed a can opener... Rafaella ran to the store to buy one so I could complete my ragu! The apartment was a great combination of modern convenience (kitchen and baths) and beautiful old-world decor and charm. There were four of us (two mature couples) and we were quite comfortable with plenty of privacy. Can't recommend it highly enough. Way Exceeded our expectations. Amazing property. Hosts were WONDERFUL!! This turned out to be by far our best accommodations in our two week trip. Our hosts were wonderful and so friendly and helpful. They even took some of our laundry to a dry cleaner and picked up for us. The apartment was immaculate and the beds were very comfortable with great pillows. The location is next to a quiet park with huge trees surrounding it. The views from the property were very good. The outside seating and yard are great and the parking a huge plus. It is really more of quaint, personal B & B type experience with the decor and special touches. Bathrooms are modern and very functional. I would come back here in heatrbeat.